stalagmites found in Whiterock Cave, Gunung Mulu NP, Malaysia. A cave explorer admires the towering ‘Night Watchmen’ stalagmites found in Whiterock Cave, Gunung Mulu National Park, Malaysia. Tropical stalagmites are invaluable climate archives as they record changes in rainfall over hundreds of thousands of years. Credit: Robbie Shone www.shonephotography.comAn international research team headed by ETH Zürich for the first time presents data on precipitation in the tropics going back 570,000 years. The data collected from stalagmites allow a detailed picture of changes in regional tropical precipitation – and show the complexity of interactions within the global climate system. Data on climate changes from the past can shed light on how the different components of the climate system interact. For this purpose, scientists try to collect data from different regions and on various aspects of climate, such as temperature and precipitation. For earlier periods of the last million years, the main part of the data comes from the polar regions. For example, ice cores give information on the composition of the atmosphere and the temperature of Antarctica. Marine sediments show how the global ice volume has changed through time. What has been missing so far is reliable data from the tropics, especially on changes in regional precipitation. As a major source of moisture and heat, the West Pacific in particular is a decisive factor in the global climate system. Scientists at ETH Zürich, the California Institute of Technology, the University of Edinburgh and the Georgia Institute of Technology now offer comprehensive data on the history of precipitation in the central tropics going back to 570,000 years. The scientists investigated stalagmites from caves in Borneo, and the results are the oldest existing climate data from stalagmites. 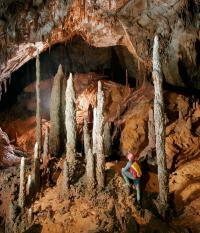 Like the well-known drill cores, these cave formations are valuable climate archives. Stalagmites record chemical changes in the drip water over long time periods, and so the scientists were able to show from rock samples how the regional precipitation developed. Their findings are presented inScience magazine (online pre-publication). “Our data yields information on a period in which some exciting changes in the climate system were taking place,” explains Nele Meckler from the Geological Institute at ETH Zürich and lead author of the study. Data from the polar regions clearly show that a distinct change in interglacial climate took place about 430,000 years ago. Before then, the interglacials were only ‘lukewarm’; i.e. the temperature of Antarctica was cooler, there was more ice on land, and the atmospheric CO2 concentration was lower. Subsequent interglacials were warmer and the CO2 content of the atmosphere higher. However, the reasons for this change are still unknown; until now, researchers have assumed that they impacted climate around the world. With their study, Meckler and her colleagues were able to show that precipitation in the central tropics in the interglacial periods before and after this change did not differ significantly. “This came as a surprise. The cooler interglacial temperatures in Antarctica and the lower CO2 content in the atmosphere do not seem to have had a great impact on precipitation in the tropical West Pacific. It stayed the same during all the interglacial periods of the last 570,000 years,” explains Meckler. She emphasises, however, that tropical precipitation was at other times strongly influenced by changes measured at high latitudes. For example, the researchers also investigated the transitions from glacial to interglacial periods. The precipitation data collected indicate that short-lived and quick climate changes in the northern hemisphere also manifested themselves strongly in the tropics. The scientists suspect that this was a reaction to changes in ocean circulation or to comparatively fast polar climate changes. “Future climate models will have to take the special situation in the tropics into account,” says Meckler. She adds that it is also important to use models in the future to examine how and when climate changes recorded at high latitudes affected the tropics.